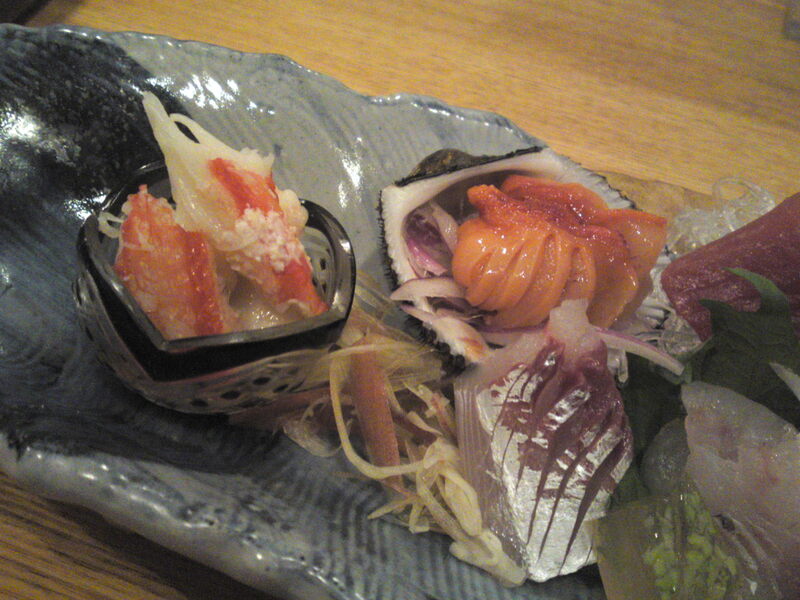 Japanese Izakaya & Seafood Restaurant: Senbon Ichi in Numazu City! Facilities: Traditional but very clean. Very clean washroom. 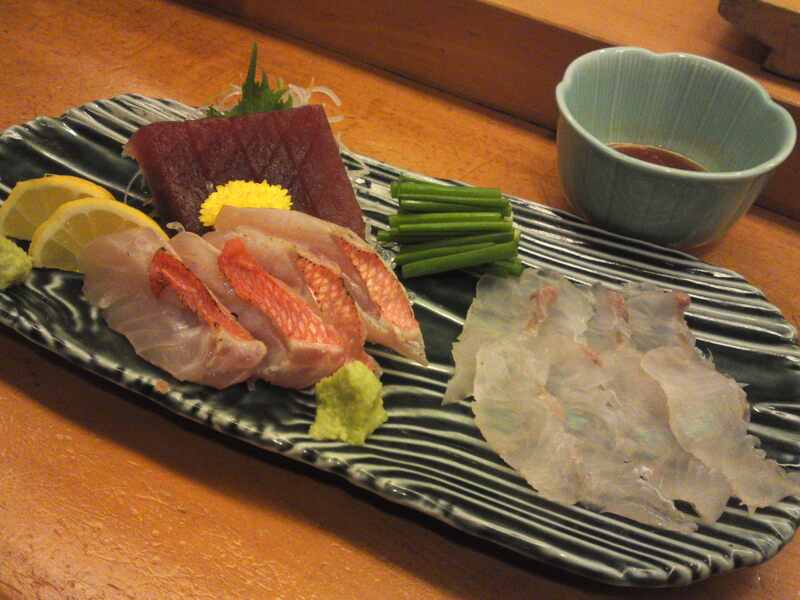 Senbon Ichi is a very traditional Japanese izakaya which specializes in fish as it is located in the middle of Numazu City fishing harbor, a major in Japan that Tokyo couldn’t do without! 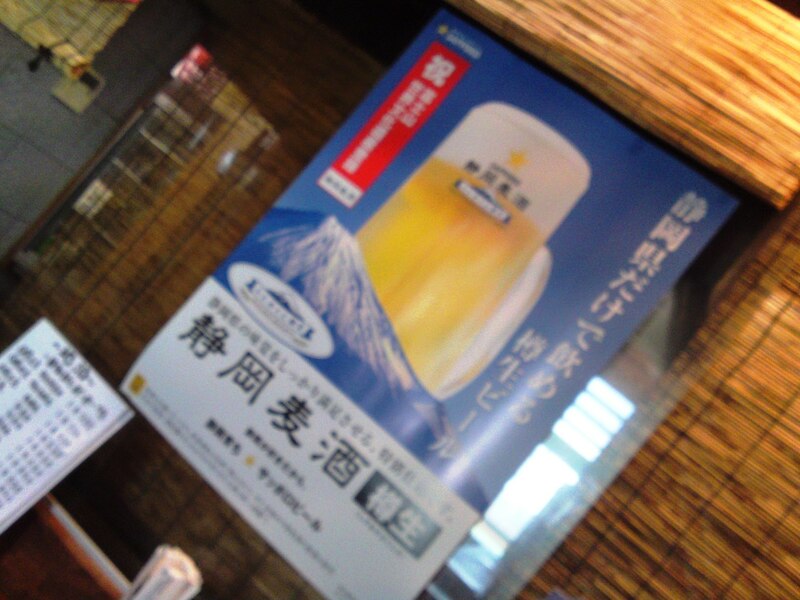 The draft beer served there, although not by a Shizuoka Brewery, is brewed in Shizuoka Prefecture! As the Numazu harbor has been recently completely renovated I paid it a short visit before planning a longer one for an extensive report. 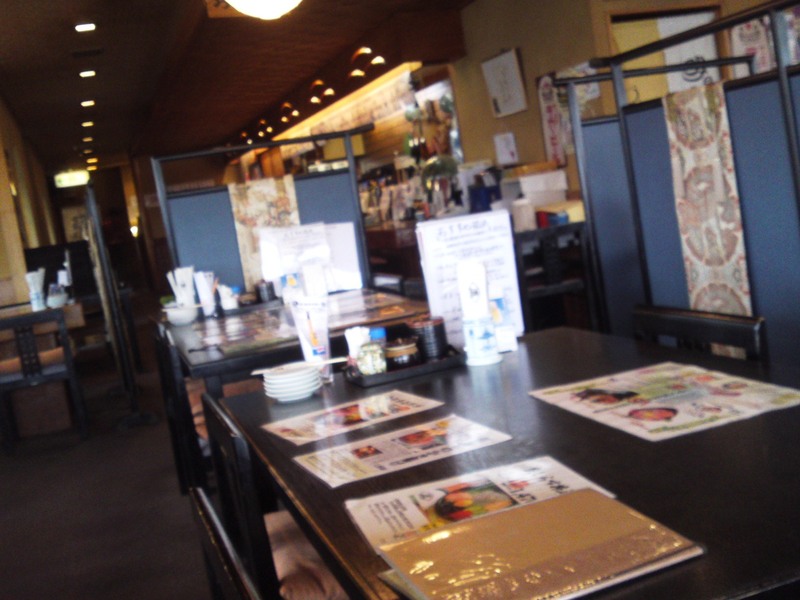 I still took the time to eat lunch at Senbon Ichi (which has two establishments under the generic name of Minato Ichi/湊一). 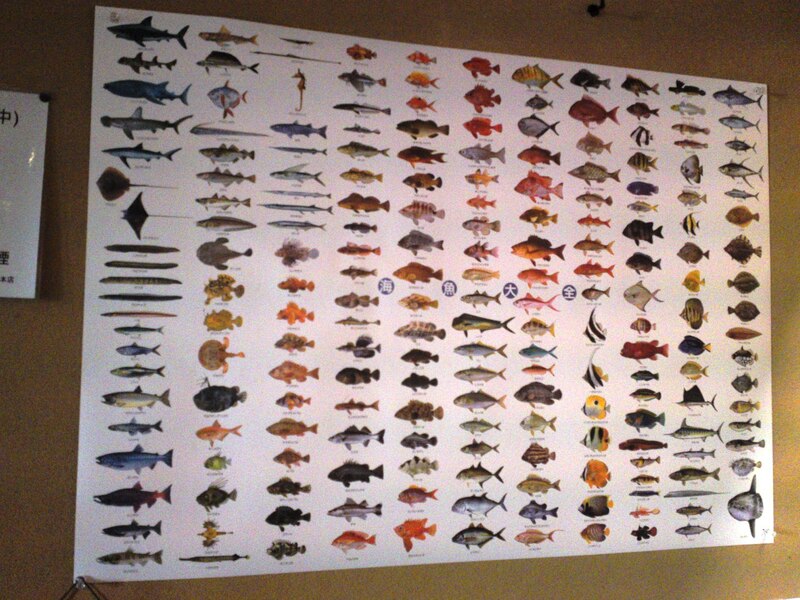 I want this poster of all the fishes caught in Japan! 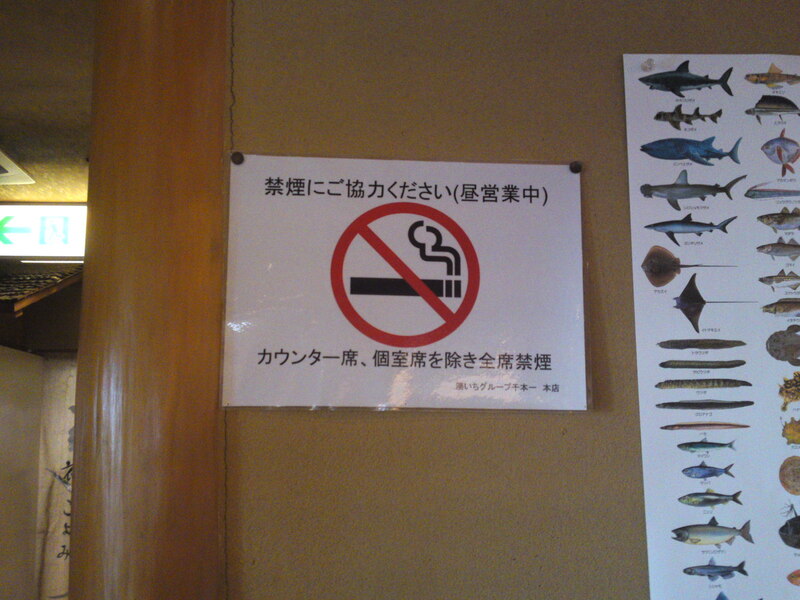 At lunch time the main dining room is non smoking. Take a seat near the windows and you shouldn’t be affected by the smokers at the counter! 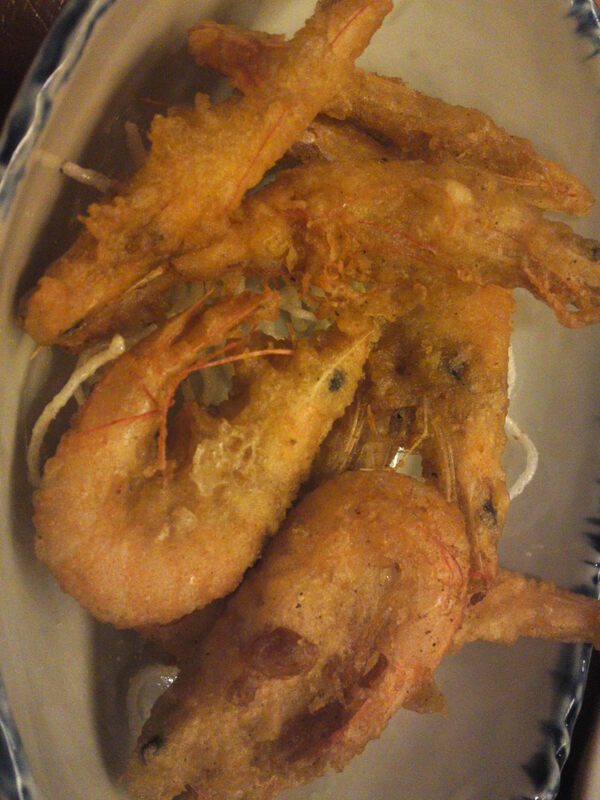 Great take-out deep-fried seafood available at reasonable prices, too! 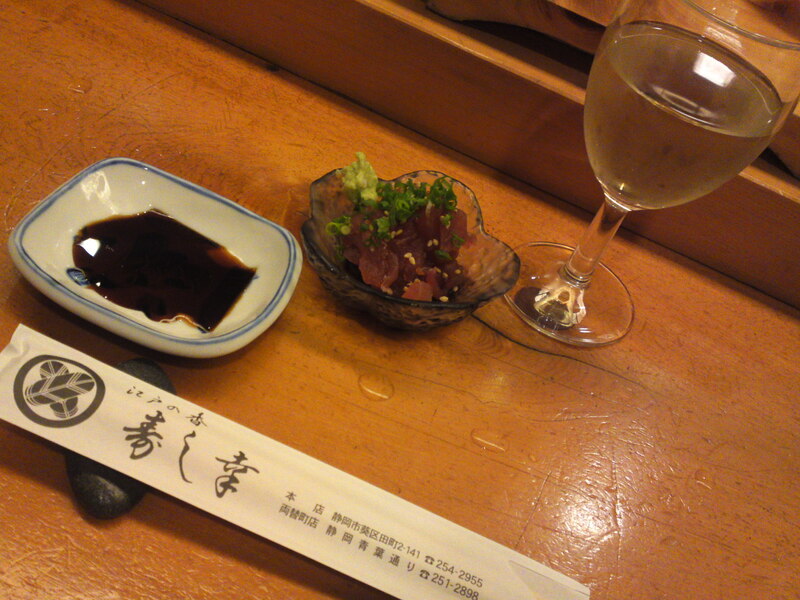 Very good point in their favor: they serve no less than 14 local sake! 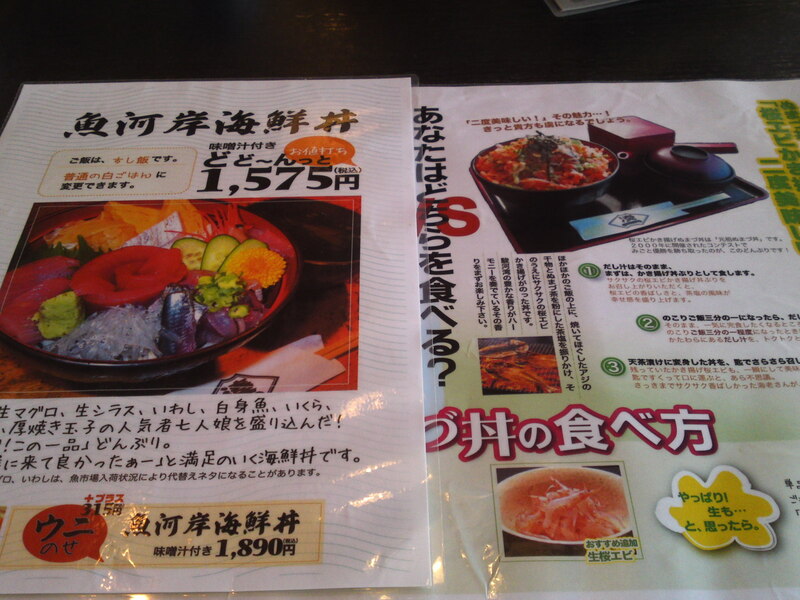 We decided to order the two specialties of the season and share them! 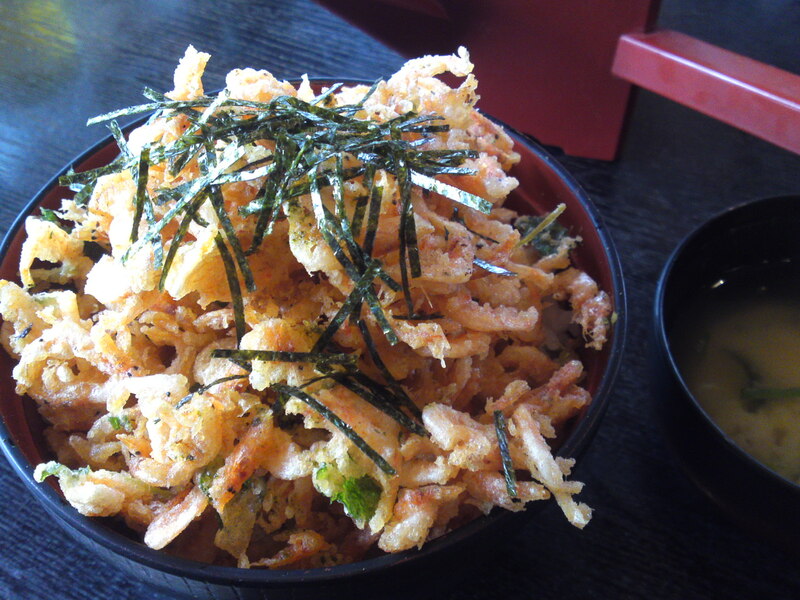 Dragon ordered the sakura ebi kakiage donburi/sushi rice top with deep-fried cherry shrimps, the specialty of Shizuoka! A real beauty and plenty of it! I pinched a few to eat with the beer! Great snack, I assure you! 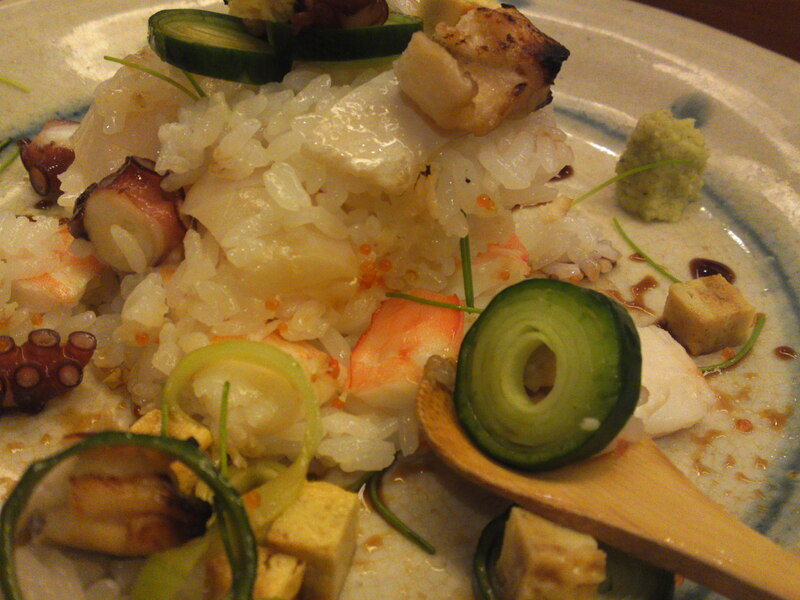 The interesting thing is that there is a layer of grilled horse mackerel under the shrimps! 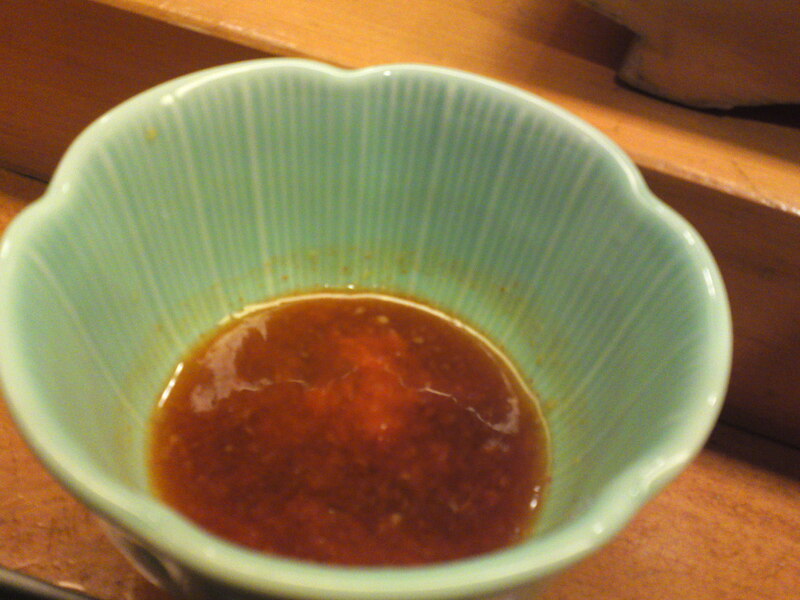 Actually Dragon was also provided with hot tea to mix it with some of her donburi for a great o-cha-zuke! 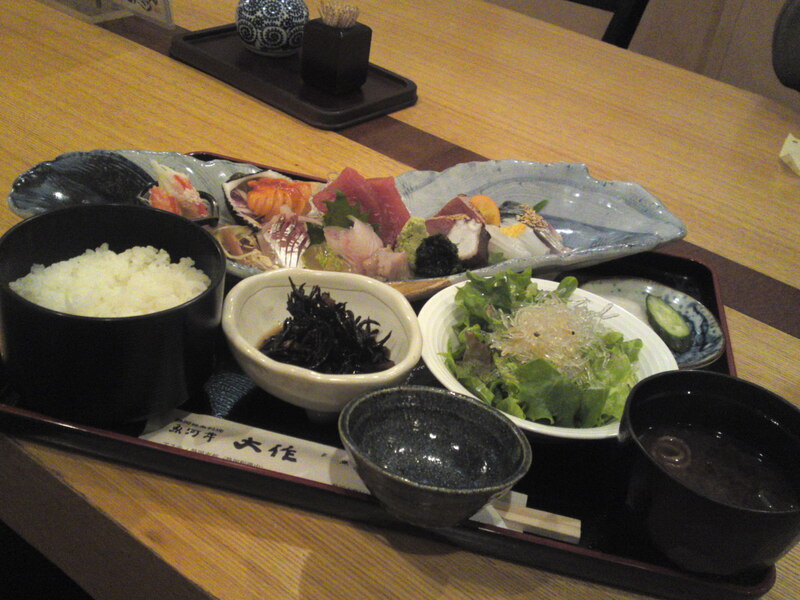 As for me, I ordered a sushi donburi topped with local fish and seafood only! 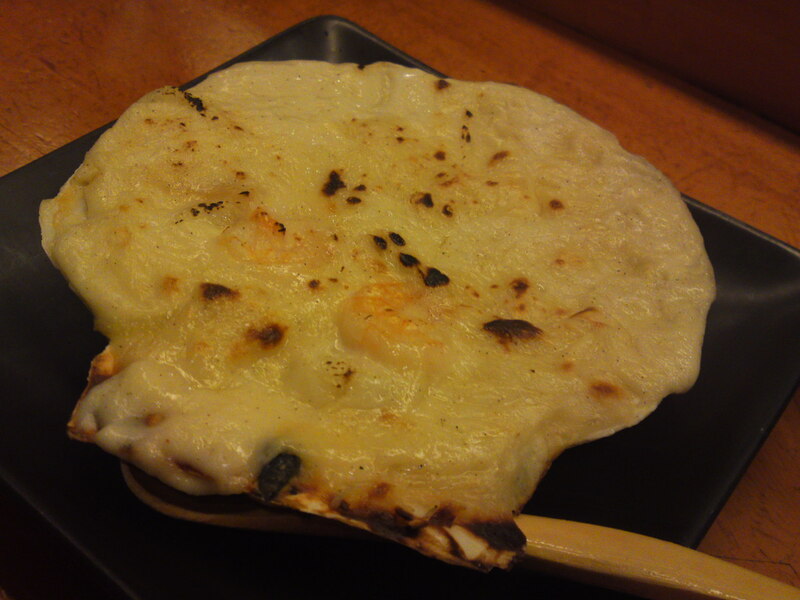 A photograph for my gastronomic collection! 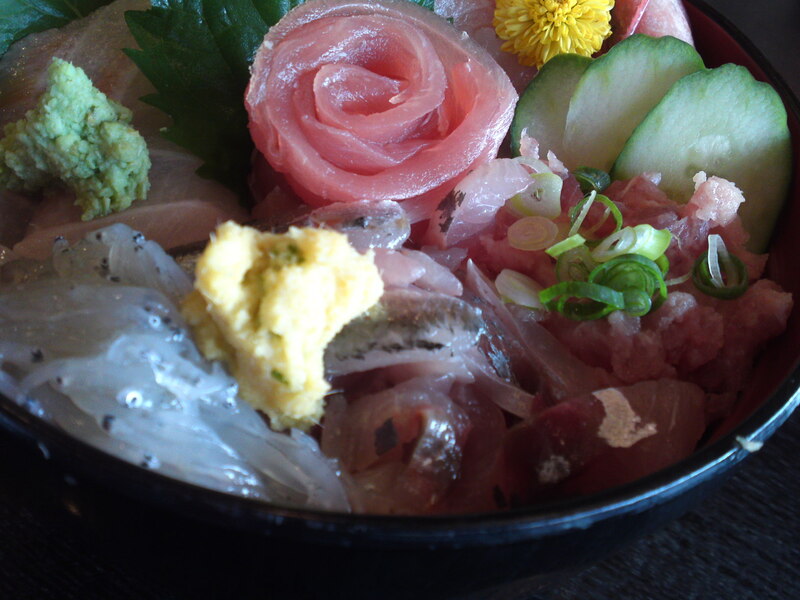 Raw shirasu/sardine whiting, sardine, horse mackerel, negitoro/grated tuna! 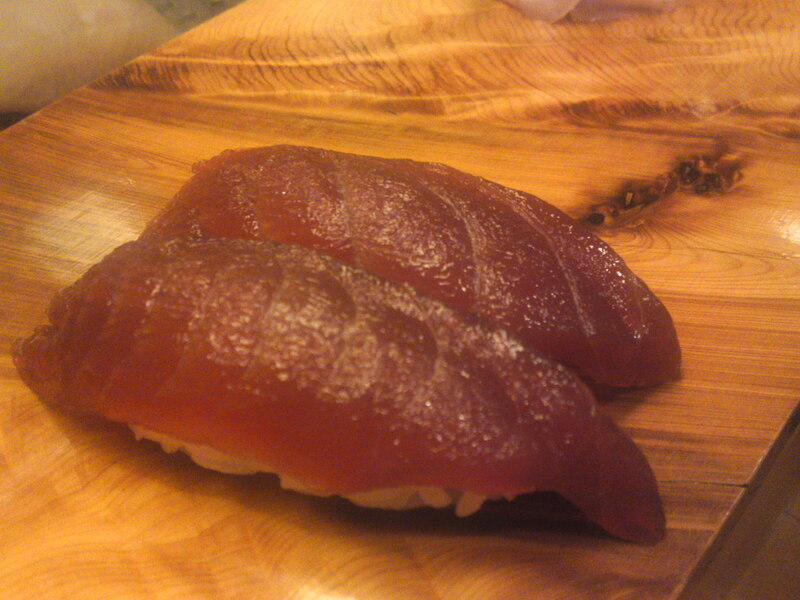 Amberjack and a rose of tuna! 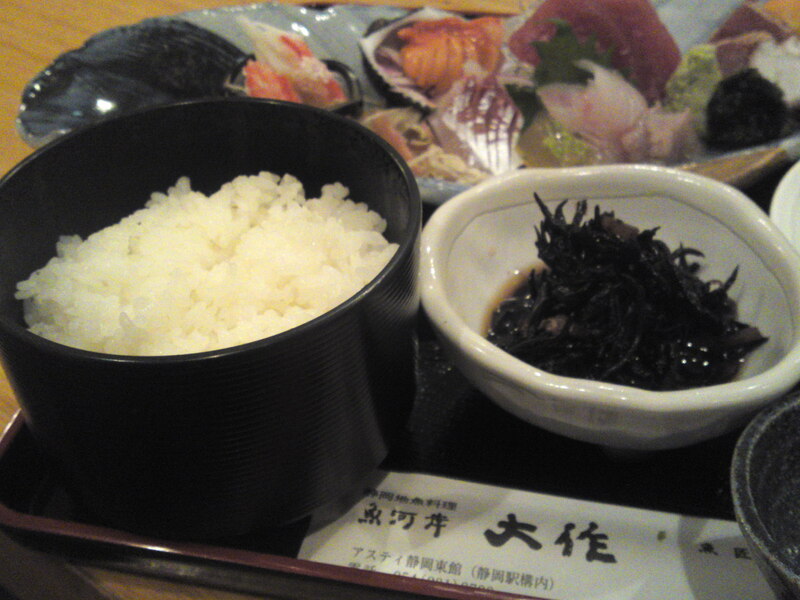 You will find a layer of finely chopped dry seaweed between the sushi rice and the sashimi! Free taxi service for groups of 7, 9 or 14 from and to Numazu, Katahama and Mishima JR Stations upon phone bookings! 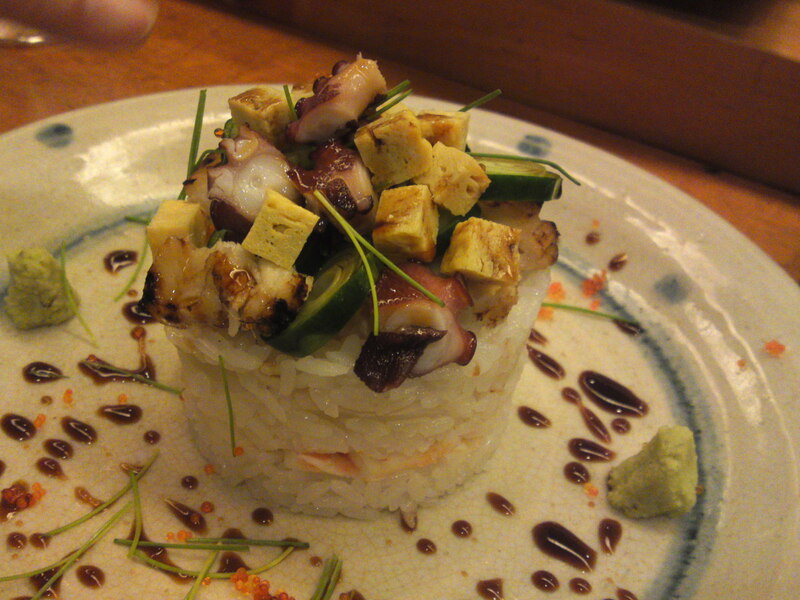 Sushi Gastronomy: My Best 10 sushi (and extras!) 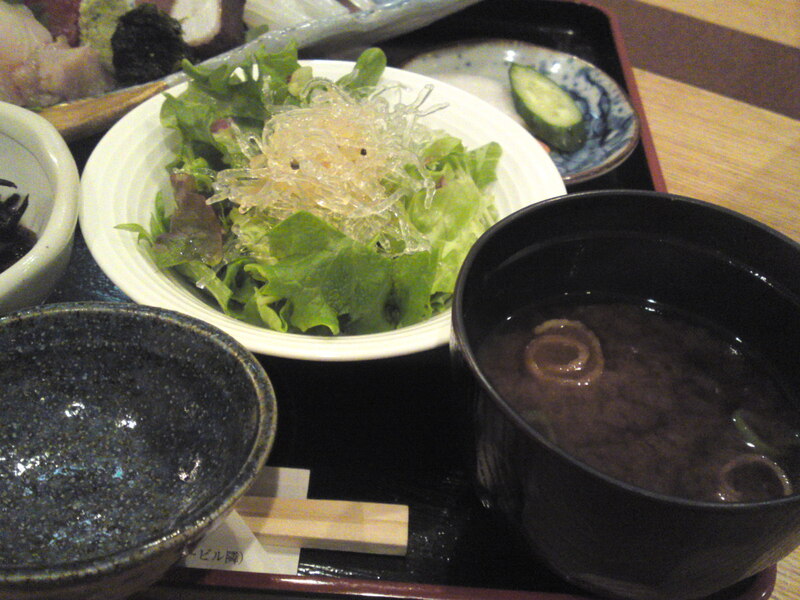 in Shizuoka in 2012! 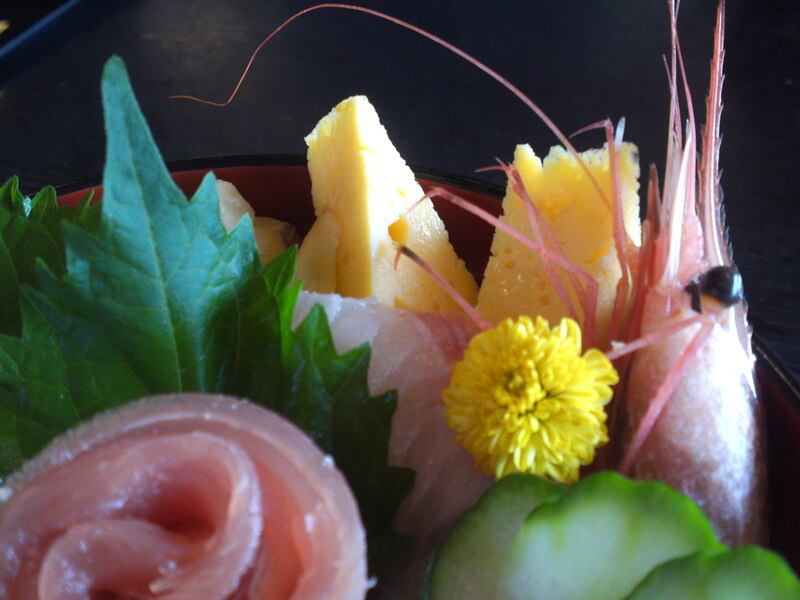 Shizuoka Prefecture is blessed with the Suruga Bay and the Izu Peninsula making it the richest (at least as far as varieties are concerned, and this by far!) 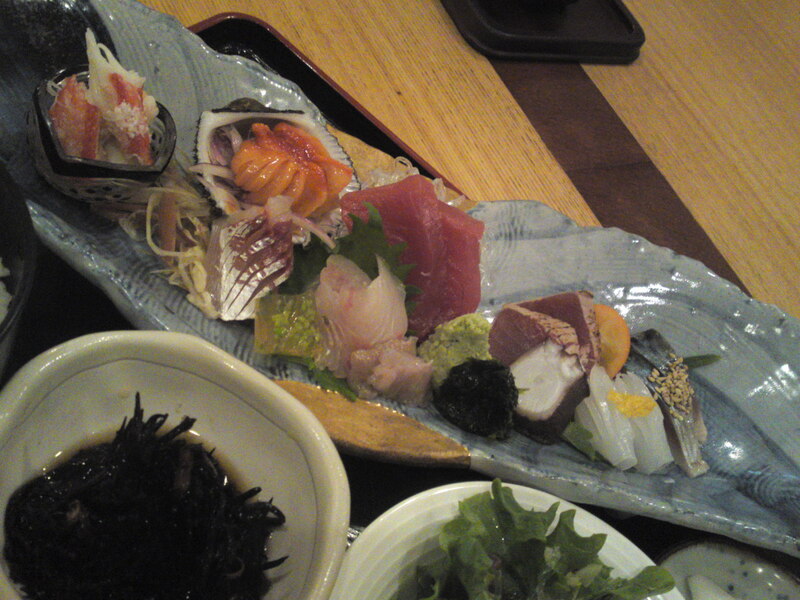 Prefecture in Japan when it comes to marine products and consequently seafood and seafood gastronomy! 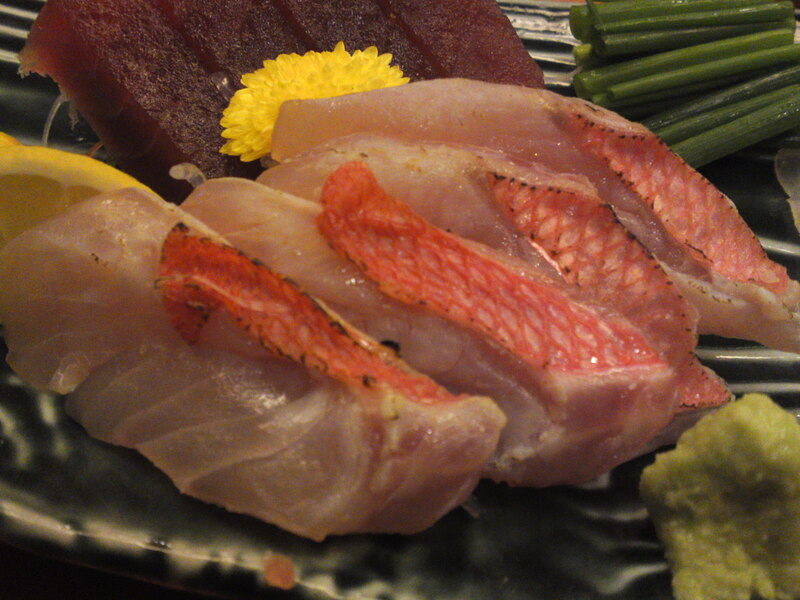 You just need to find one good sushi restaurant here and there will be no need to go the vaunted establishments in Tokyo where practically nothing is fresh and where all is expensive! 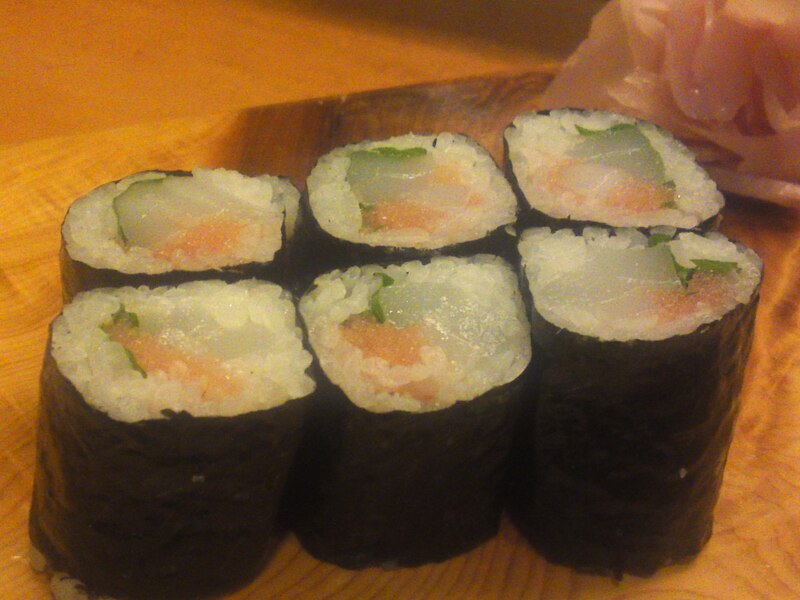 I regularly eat sushi in restaurants and at home (home-made! 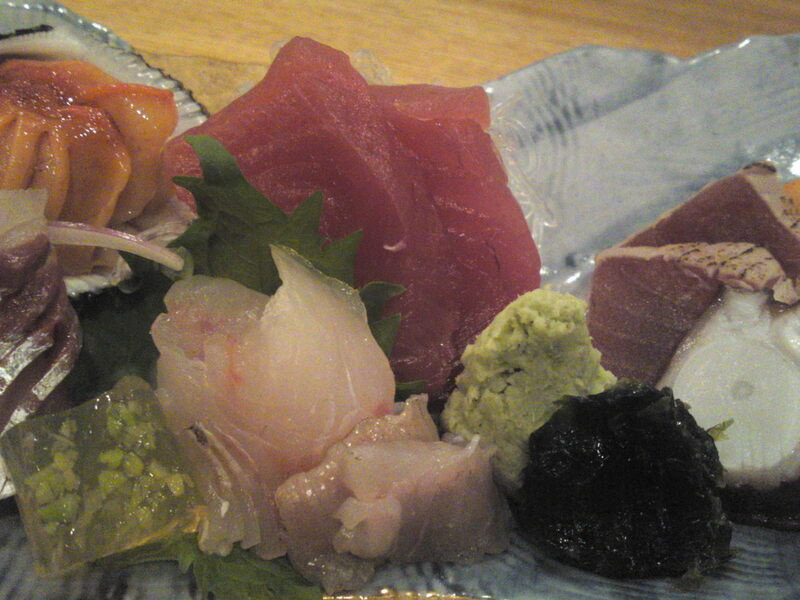 ), and I have one favorite establishment called Sushi Ko in Shizuoka City where you can only be overwhelmed by the variety, quality and reasonable prices. All pictures represented in this article but one were taken there! Just follow me, if you please! 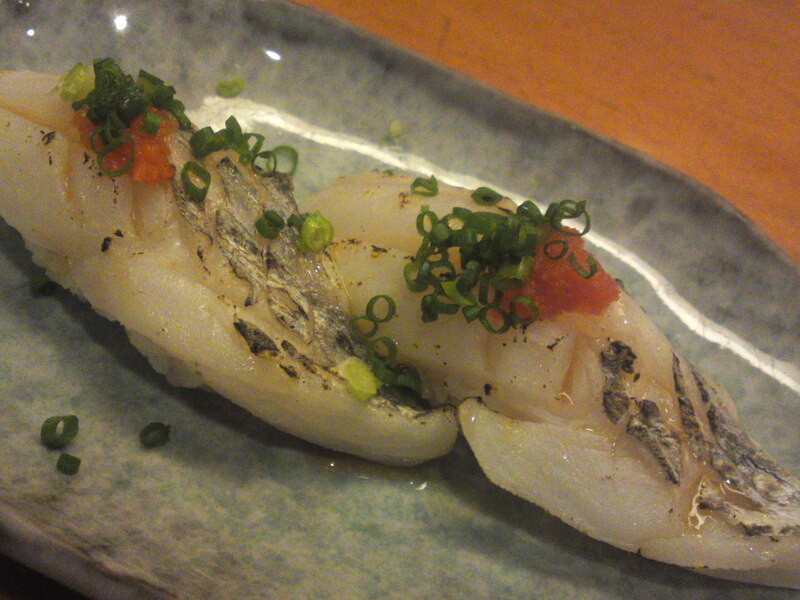 This nigiri was small because most of the kawahagi had been served as sashimi, but Chef Mirugawa kept enough to fashion a few of these cute nigiri with chopped scallions under the “neta”/fish slice topped with a piece of liver of the same fish seasoned with a little momiji oroshi/grated daikon with chili pepper powder! 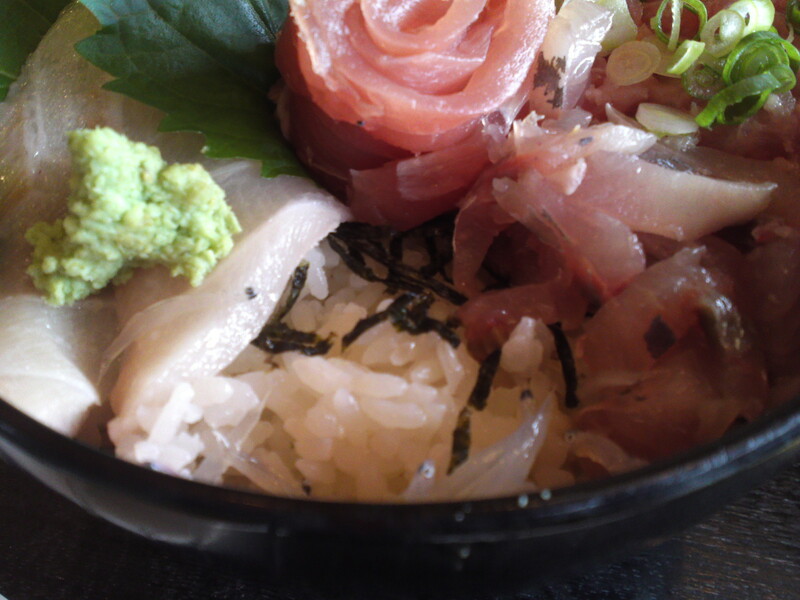 Katsuobushi was inserted between the “shari”/rice ball and the leek sprouts. 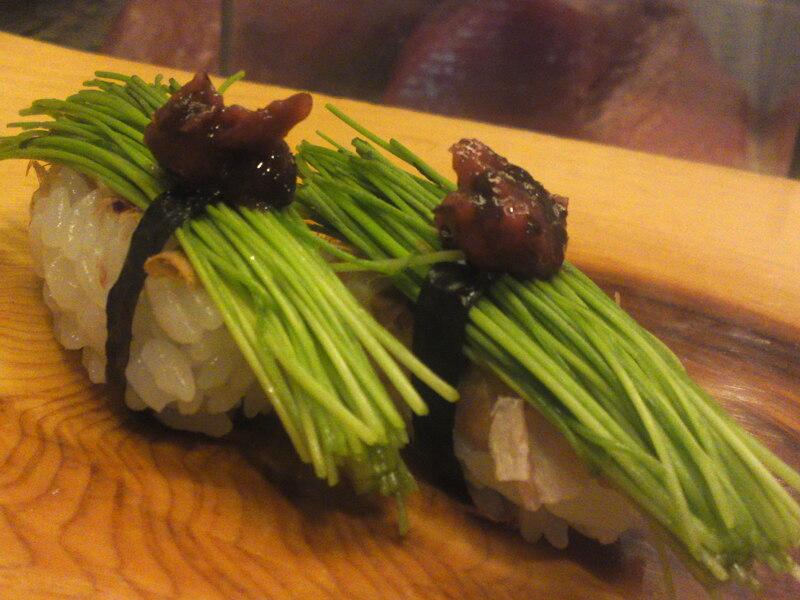 The whole was secured with a narrow band of nori/dry seaweed and topped with some umeboshi/salty pickled Japanese plum paste! 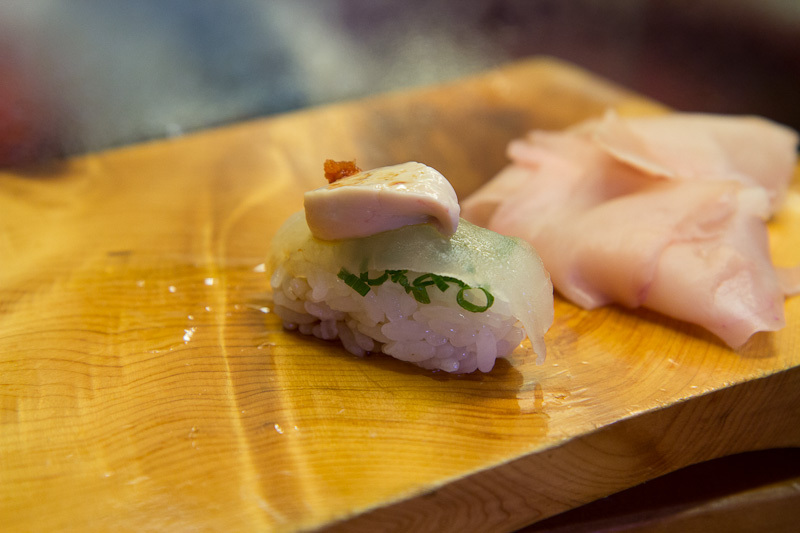 Tachiuo Aburi/太刀魚炙り/Seared scabbard fish nigiri!The scabbard fish was first seared on the skin side and then placed atop the shari and decorated with some momiji oroshi. 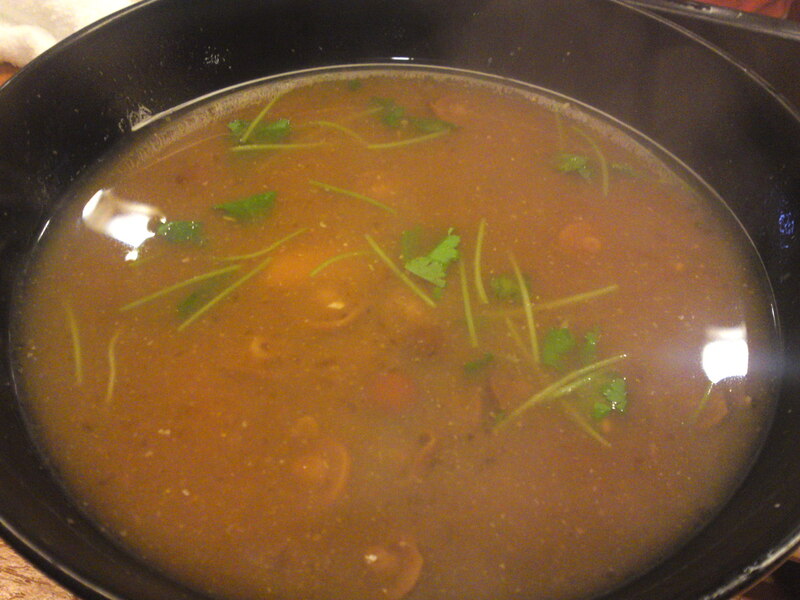 It was finally seasoned with ponzu (no soy sauce there)! 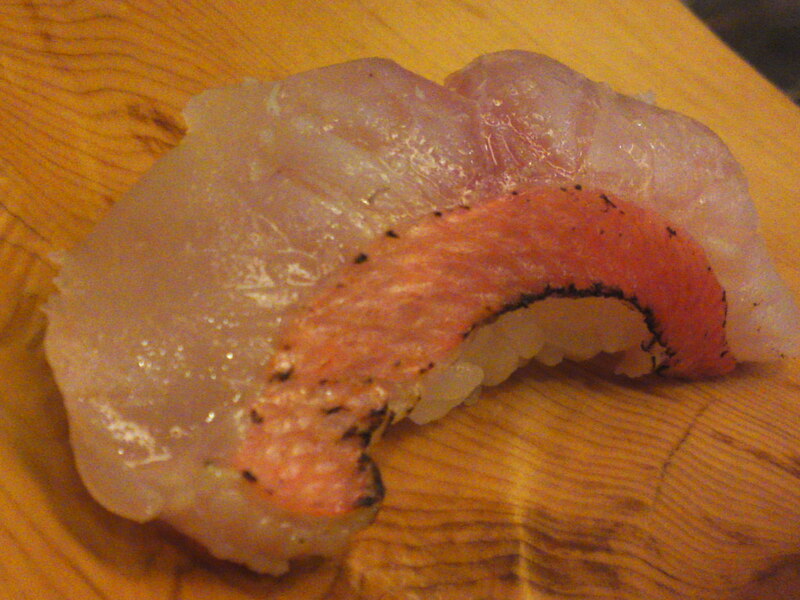 Kinmedai Aburi/金目鯛炙り/Seared splendid alfonsino (variety of seabream) nigiri! 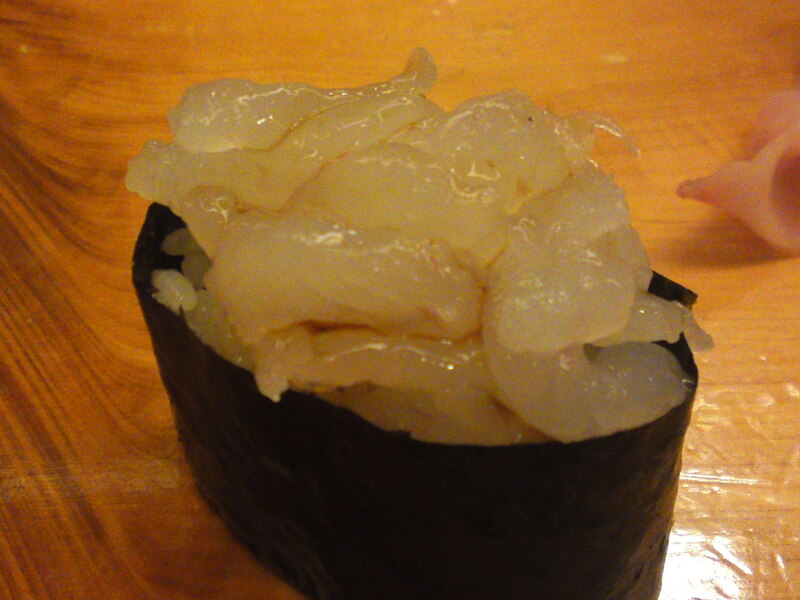 The kinmedai was first seared on the skin side and carefully placed in the shape of a crescent atop the rice ball! 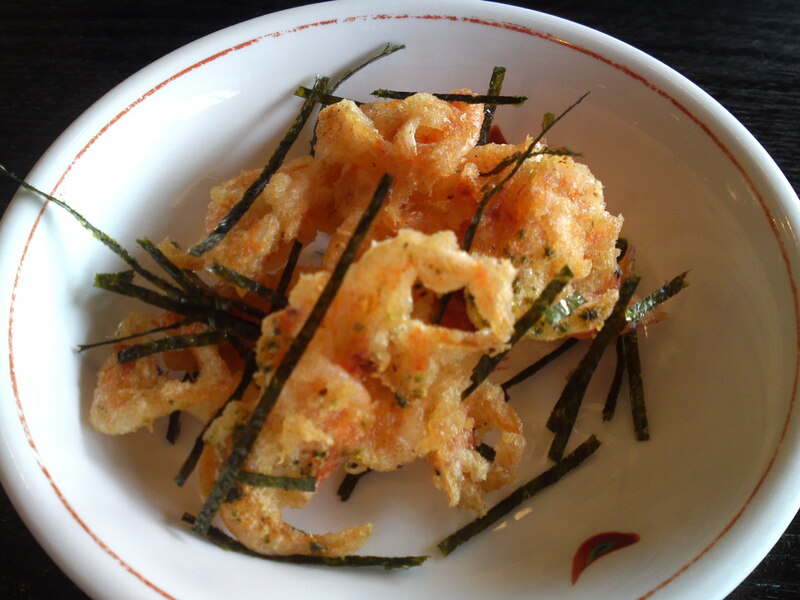 “Zuke” stands for the word “marinated”. 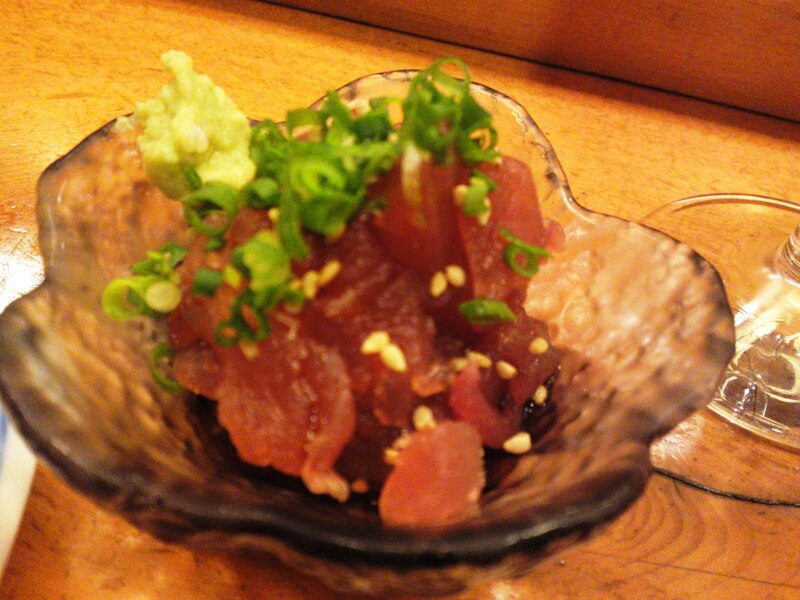 The fish is lean red tuna or “akami” marinated in a mixture of soy sauce, mirin, sake and other “secret” ingredients according to each chef. 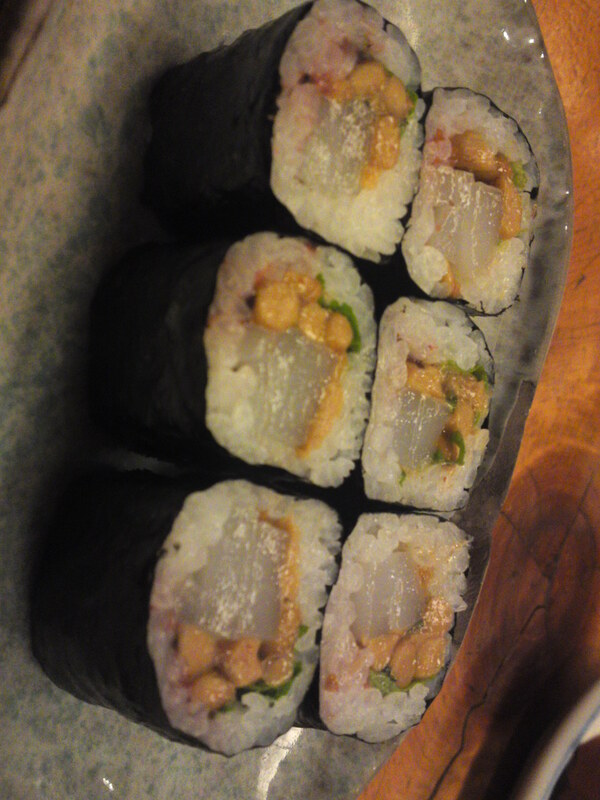 A must at any worthy sushi restaurant! 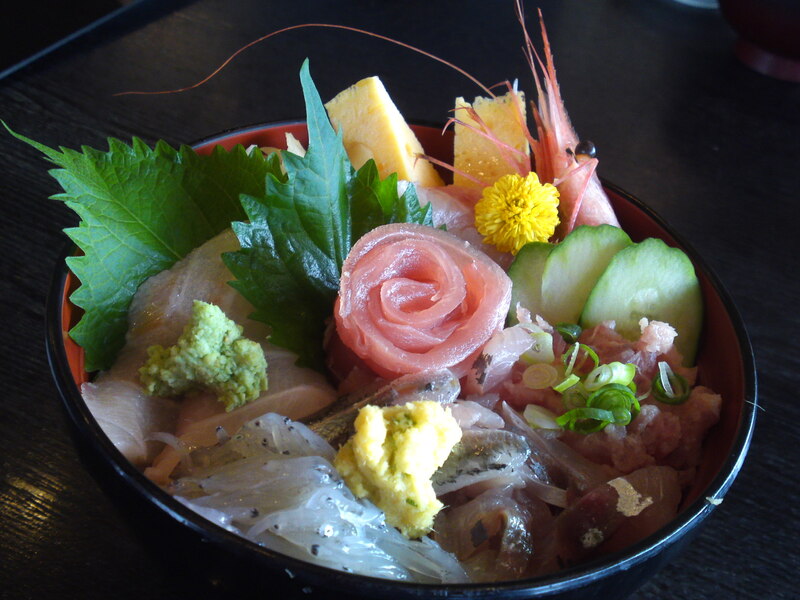 You will find this sushi made with fresh shirasu only in Shizuoka Prefecture, that is unless you are ready to empty your purse in Tokyo! 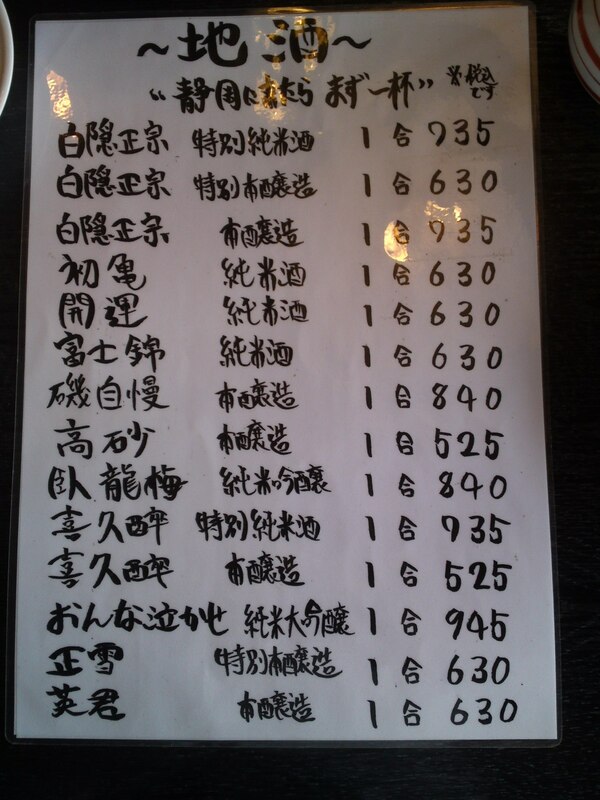 It is cheap here as it is a local specialty. 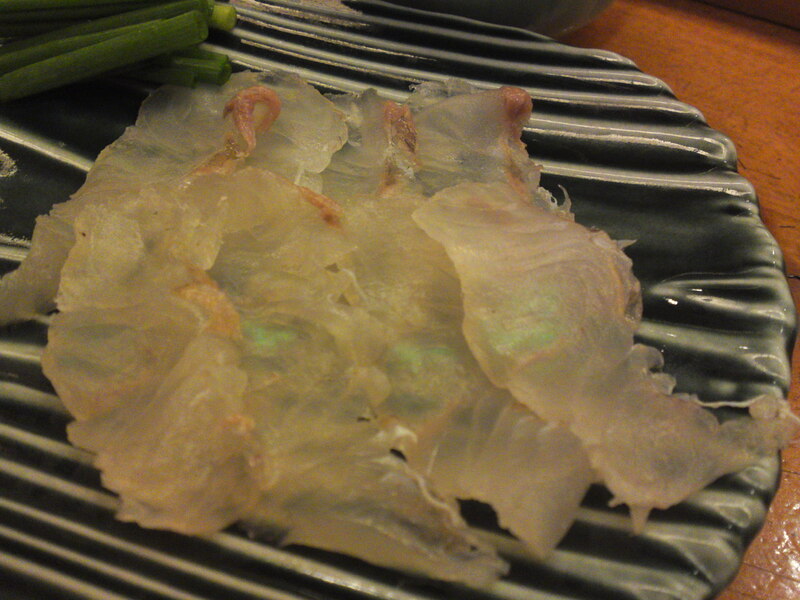 The fish is usually served in “gunkan/mothership” fashion topped with grated ginger and finely chopped scallion! 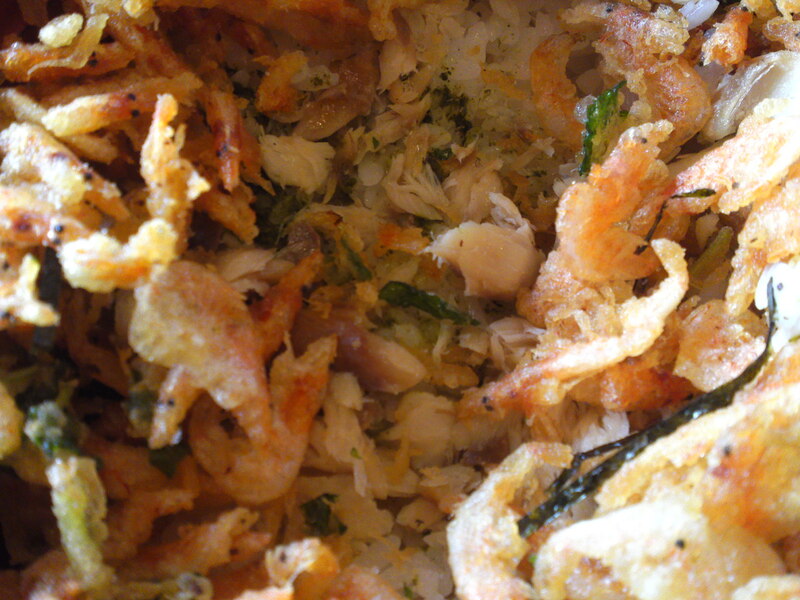 Another must if you visit our Prefecture! 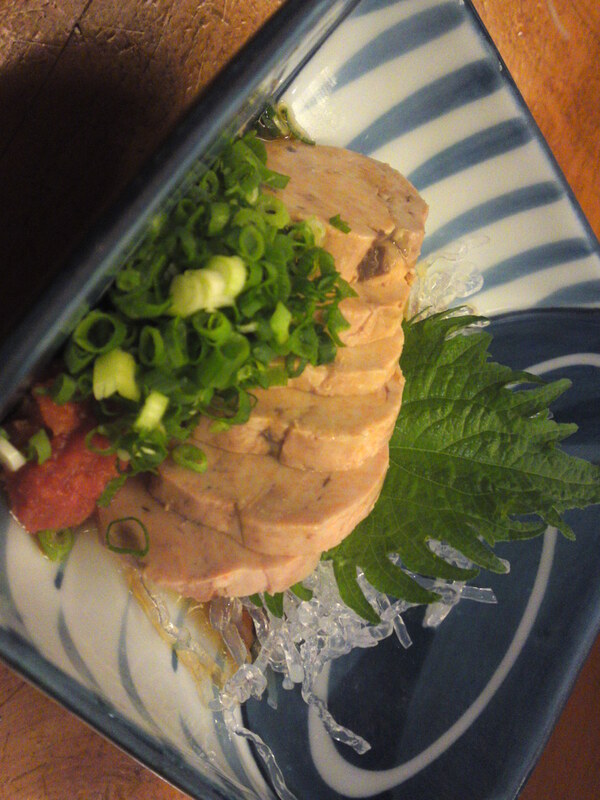 Ankimo is also called “Japanese foie gras” as it is made with the liver of ankou/鮟鱇/Frogfish or monkfish which had been steamed in sake and wrapped and kept inside the refrigerator long enough so as to form a kind of sausage before being sliced. 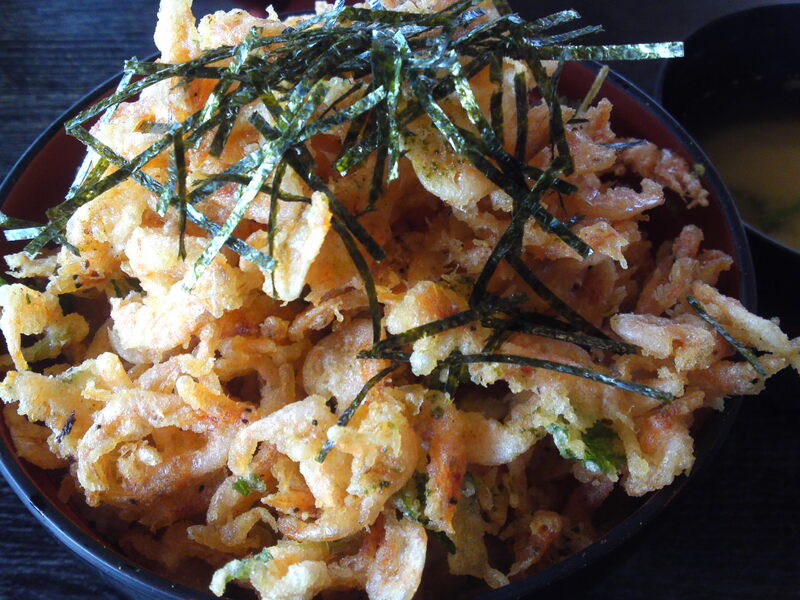 It is usually served as gunkan or nigiri or as an appetizer topped with finally chopped scallion and momiji oroshi and seasoned with ponzu! 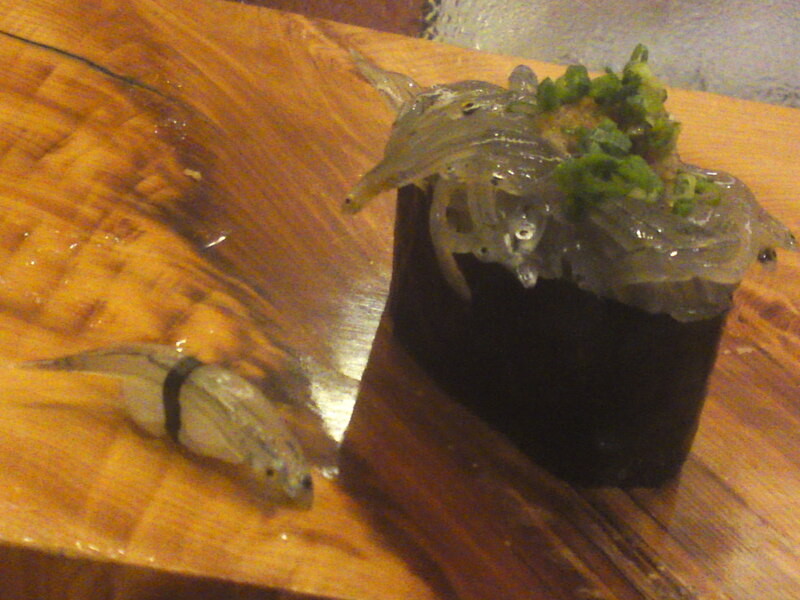 This rainbow trout sushi was served to me at Myouken Sushi Restaurant in Gotemba City. 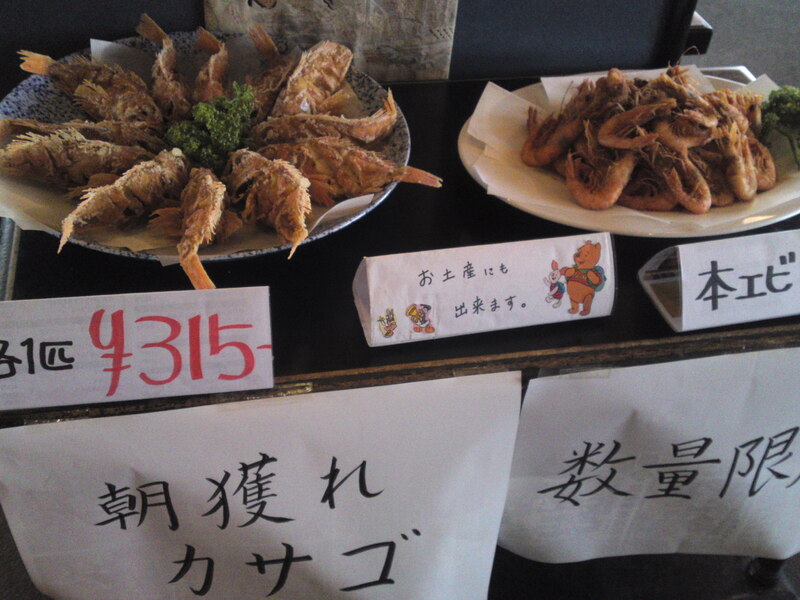 The rainbow trout was bred in Fujinomiya City. 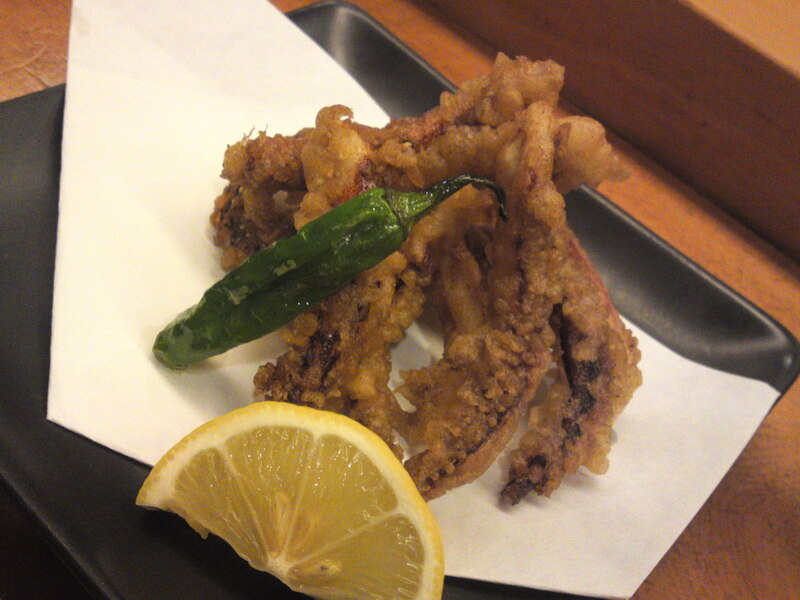 “Bogata/棒形” stands for “Baton Shape”. 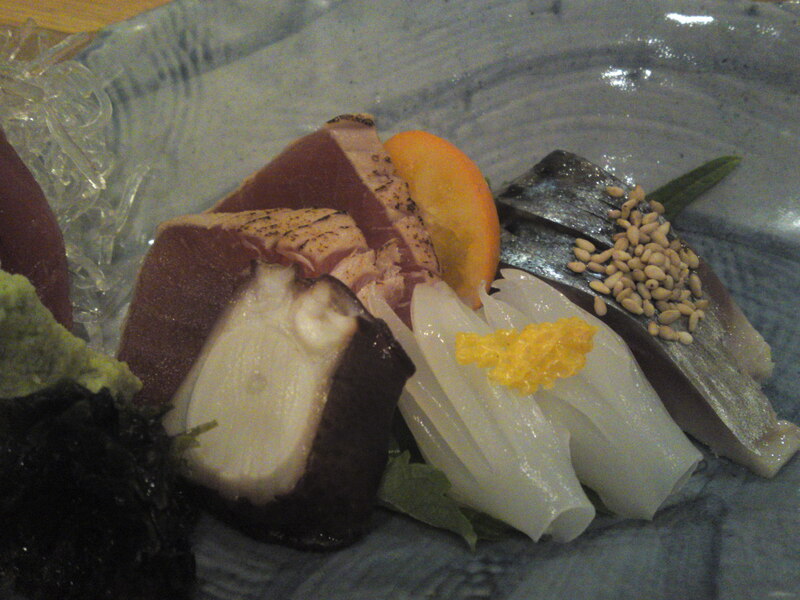 This form of sushi originated from Western Japan. 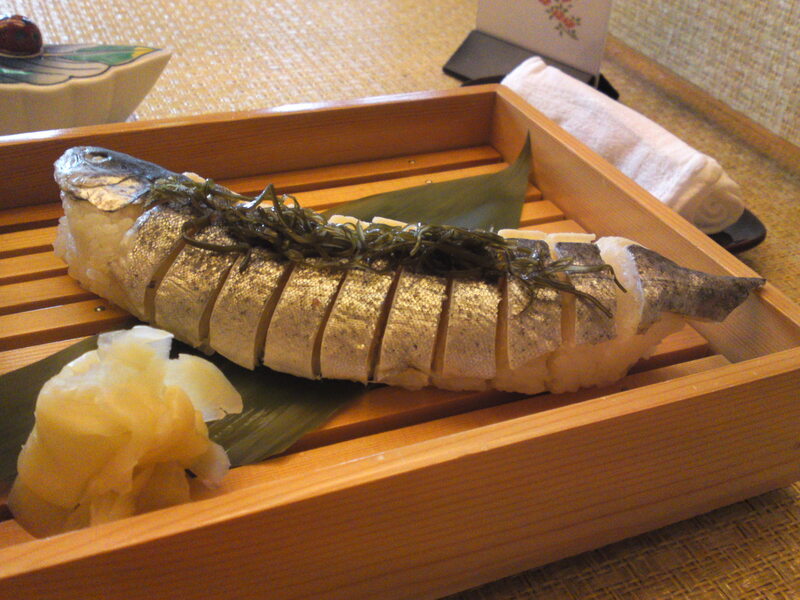 The whole marinated and seared fish is pressed together with the rice as a variety of “oshizushi/pressed sushi”! 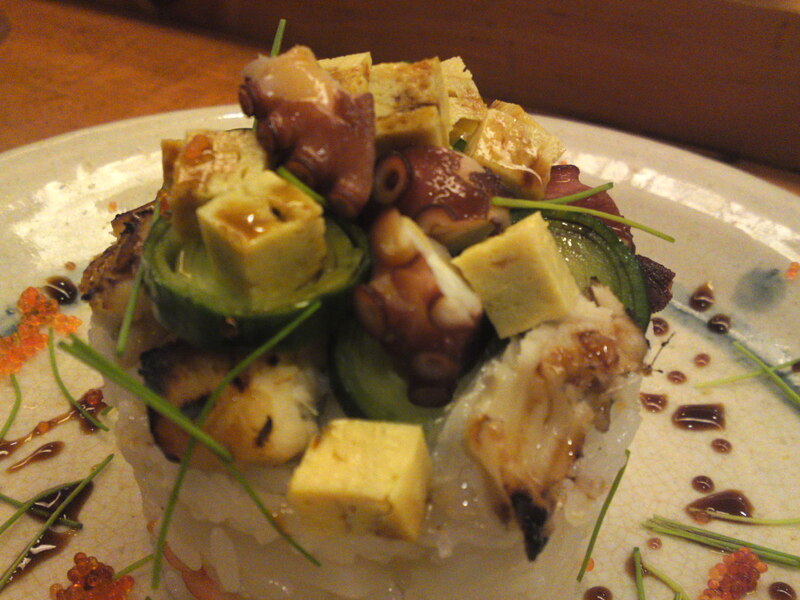 Chef Mirukawa at Sushi Ko is a great chef who was awarded the Title of “Top Sushi Design Chef in Japan” this very year! 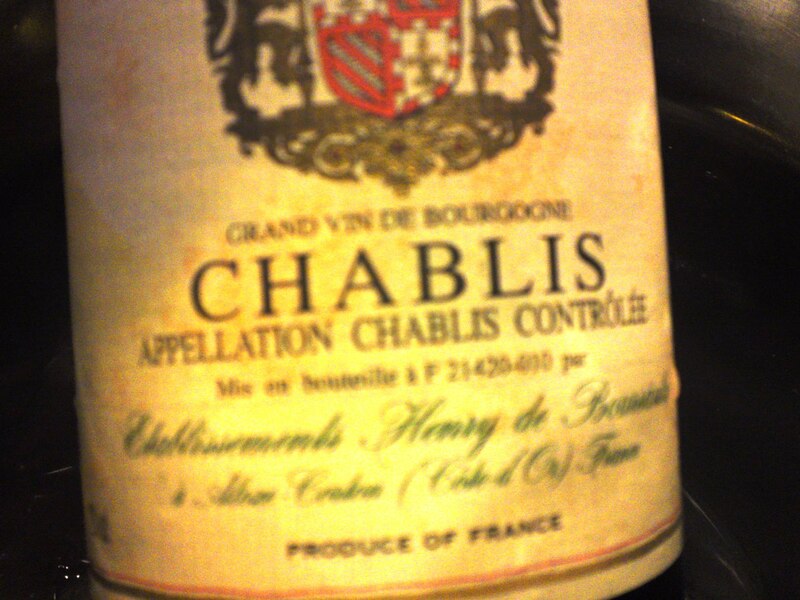 His specialty is Millefeuille (you know, the French cake meaning “A Thousand Leaves”!). 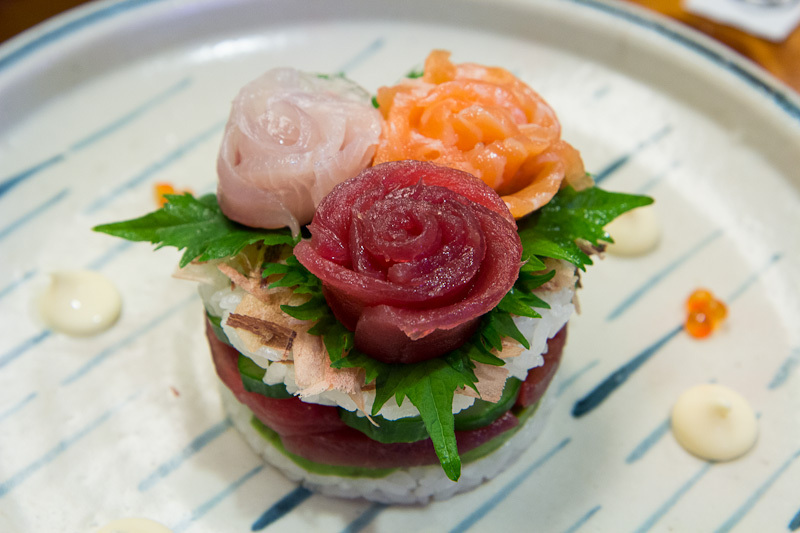 This particular one is made with a layer of sushi rice, a layer of avocado, a layer of akami/lean tuna, a layer of sliced cucumber, another layer of sushi rice, katsuo bushi/dry bonito shavings, shiso/perilla leaves and three “Roses” made with raw tuna, salmon and hirame/平目/Flounder! 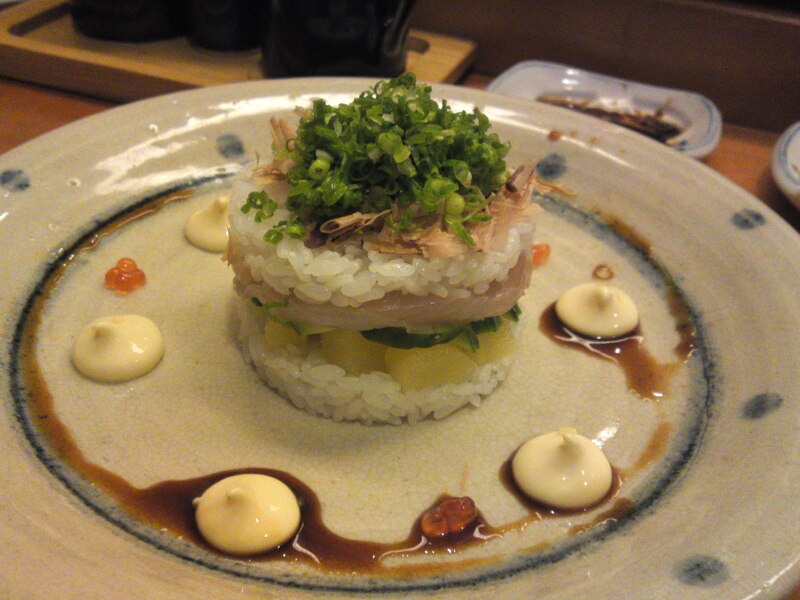 This “Japanese-style” Millefeuille consisted of a layer of sushi rice, a layer of Kazunoko/数の子/Herring roe, a layer of sliced cucumber, a layer of Kanpachi/環八/Purplish amberjack, Greater yellowtail, katuobushi and finely chopped scallion! 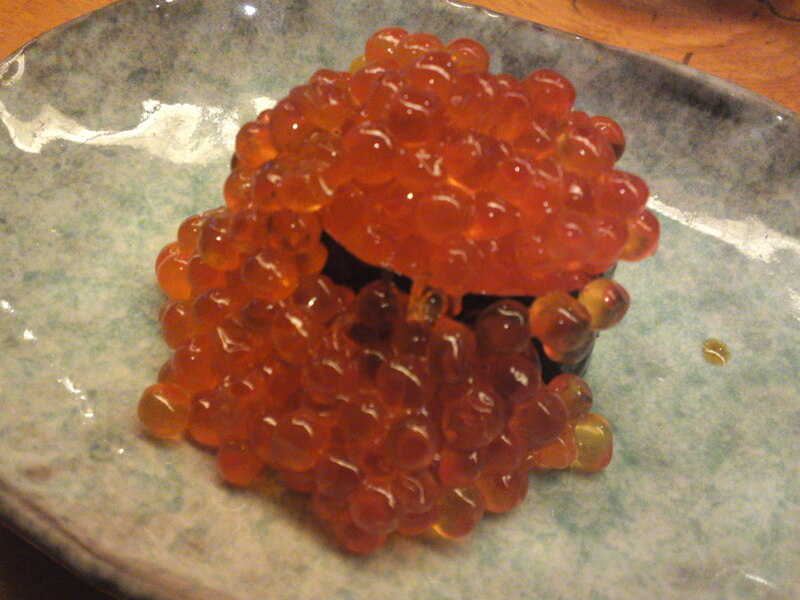 It was served with mayonnaise, soy sauce and ikura/salmon roe! 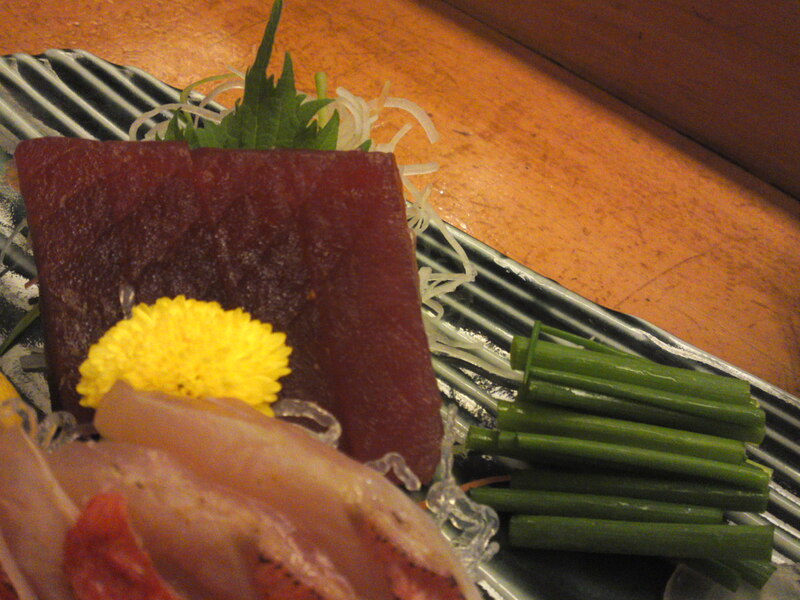 Chef Mirukawa composed this piece of art after my neighbors saw the “Roses Millefeuille”. As one of them was acually celebrating her birthday on that very day, the Chef came with this incredible idea! 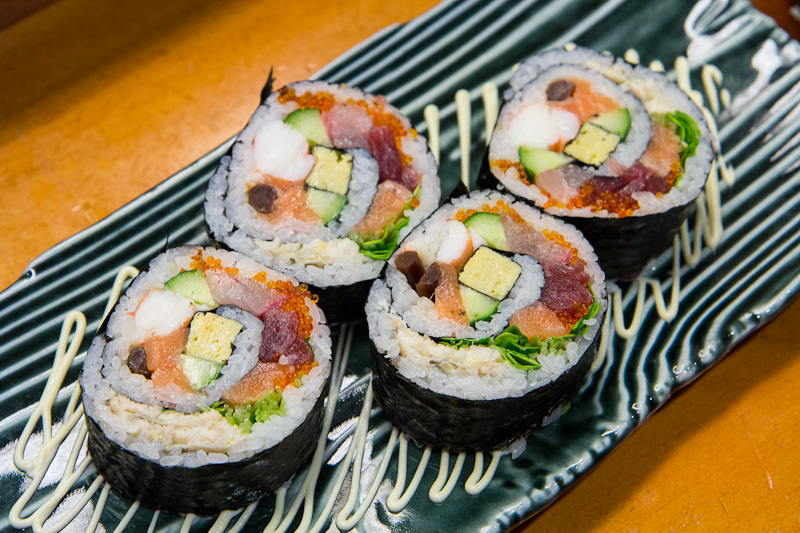 Six different sushi in one! 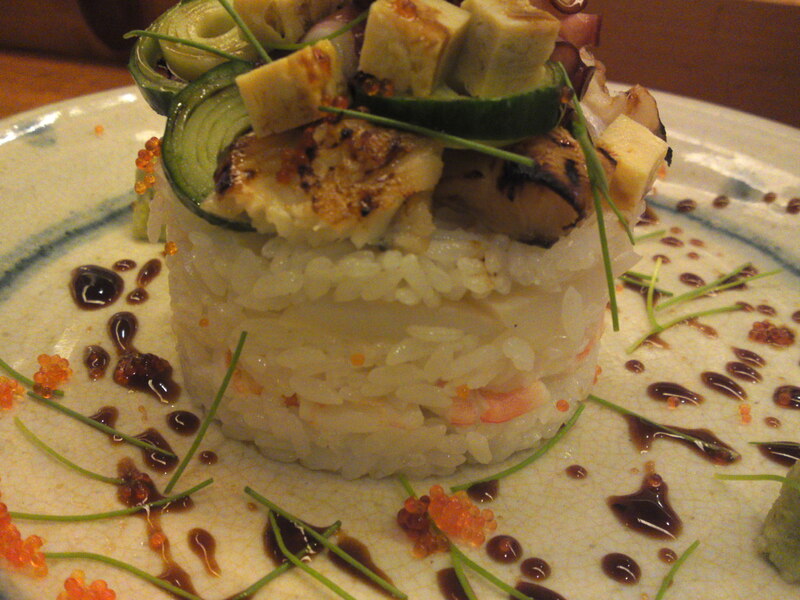 A layer of sushi rice, a layer of avocado, a layer of akami tuna, a layer of sliced cucumber and a layer of sushi rice. 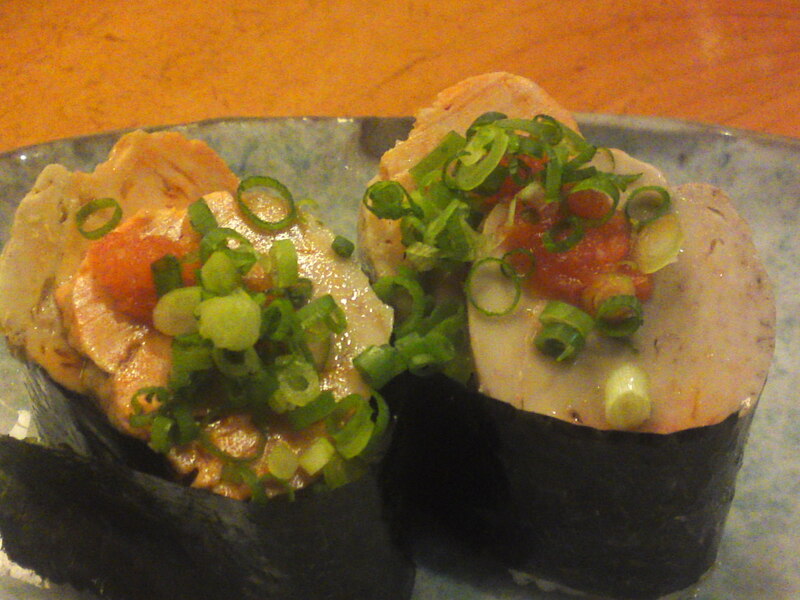 The whole was topped with miniature akami rolls, akami nigiri, raw salmon nigiri, Sakura ebi/桜海老/Cherry Shrimps (found fresh only in Shizuoka Prefecture!) 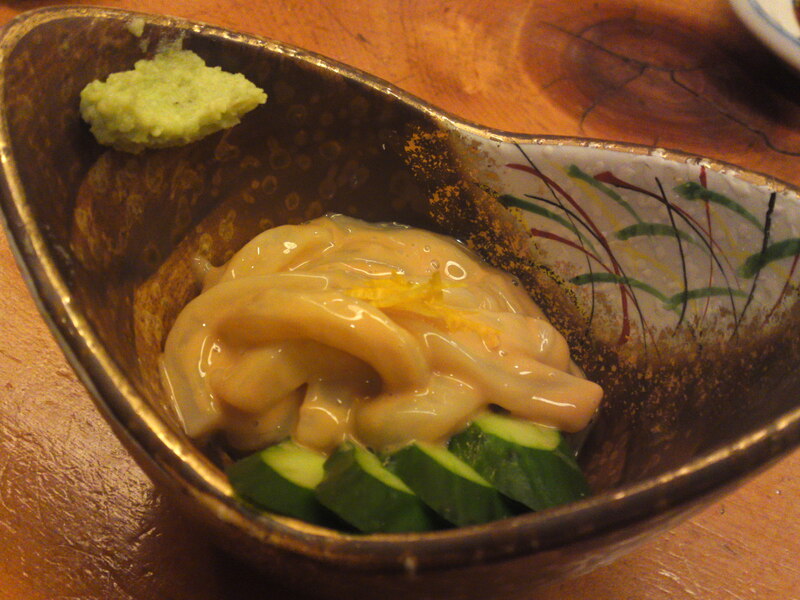 and Flying fish roe and cucumber gunkan! 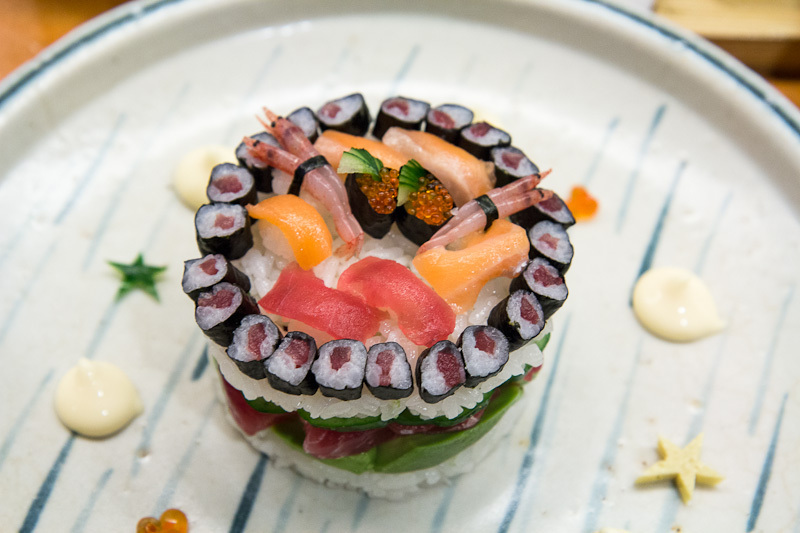 The ultimate Sushi Birthday cake! 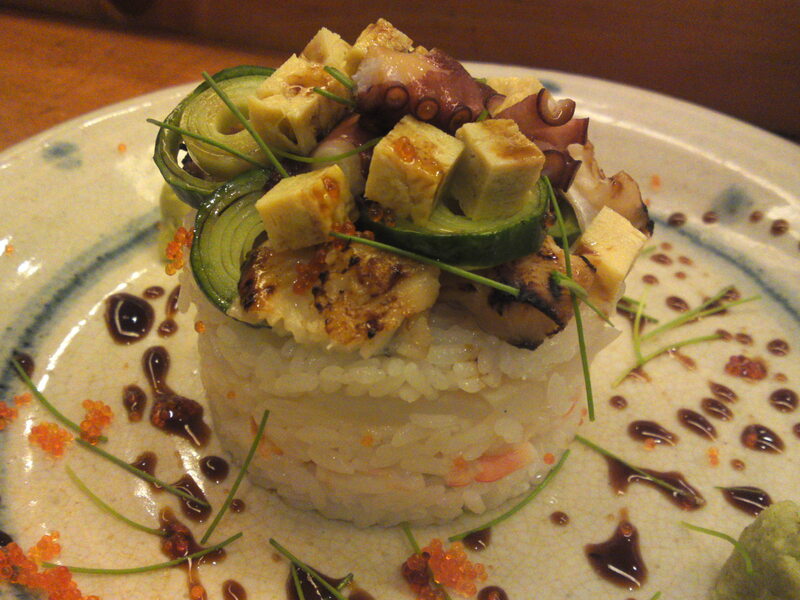 Another piece of art by Chef Mirukawa! Incredible patience was certainly needed there! 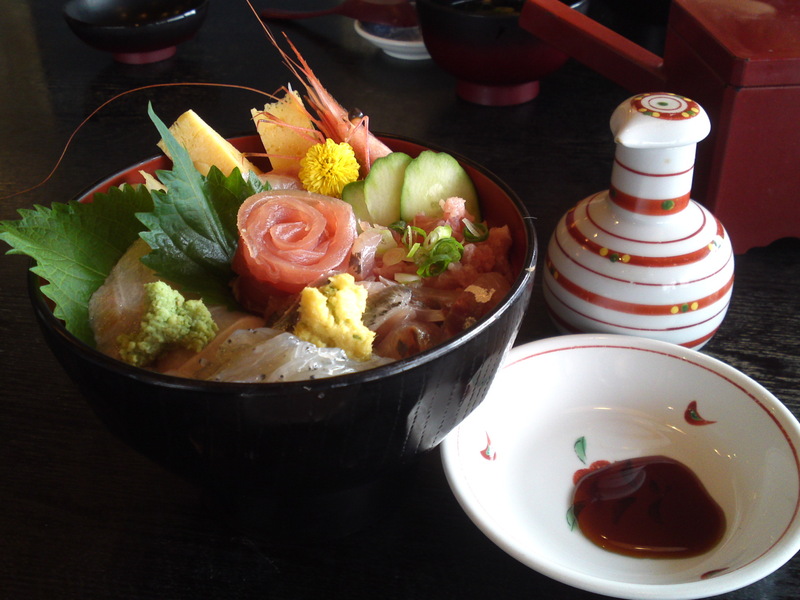 It includes sushi rice, Spicy scallop salad, lettuce, salmon, akami tuna, kampachi, cucumber, prawn, flying fish roe, kanpyou/寛平/gourd shavings, tamagoyaki/Japanese omelet and nori/dry seaweed, the whole seasoned with mayonnaise! 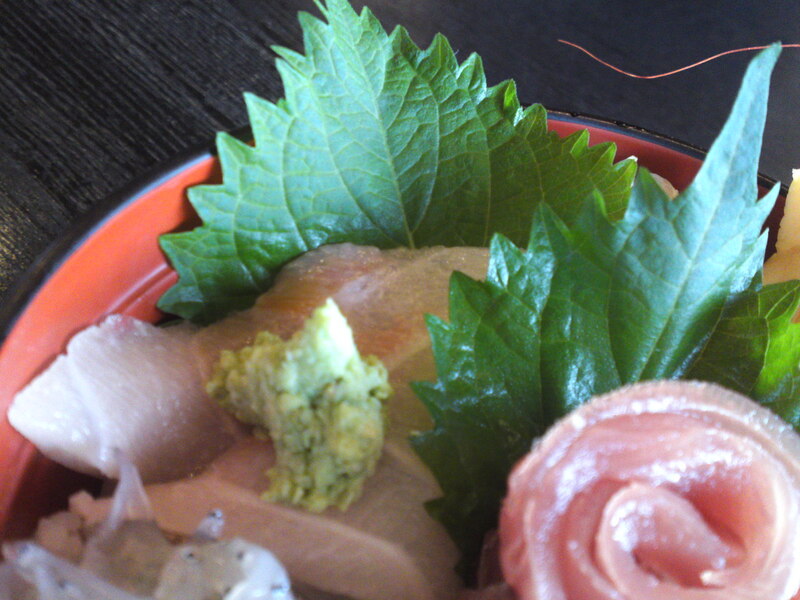 To represent the Italian flag Chef Mirukawa included green shiso leaves, white ika/烏賊/squid and red mentaiko/明太子/pickled cod roe! Can’t wait for for 2013!